In order to ensure the authenticity of all businesses on ServiceSeeking.com.au, we’re introducing Compulsory Background Checks for all businesses registered on the site. This assures every business a fair game. You no longer have to worry that you might be competing with dodgy or fraudulent businesses. Who will do the background checks? 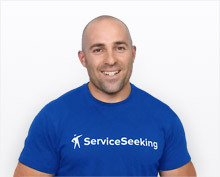 ServiceSeeking.com.au has entered into a new partnership with employee screening company Risq Group. Risq Group, the leading screening company in the Asia Pacific Region, will run in-depth background checks on all of the businesses listed on our site and let us know which meet their criteria. 1. Purchase the KNOWN Badge and a member of our team will get in touch with you ASAP. 2. We’ll ask you to submit a photo of your driver’s licence or a combination of your driver’s licence and industry/trade licence to RISQ. 3. Once you have passed the background check, a KNOWN badge will be displayed on your profile. Competition in various industries can be tough, so you’ll need to think of ways on how you can convince potential customers to pick you over other businesses. Of course, one thing you can do is build up your credibility. This can be easily done if you’ve been verified to have the qualifications and industry licences. Your KNOWN badge will appear on your profile, quotes, and quote emails. This makes it easier for customers to know that you are a trustworthy business. We let customers know what the KNOWN badge means. We notify and tell them that businesses with the KNOWN badge are of the highest quality. You’ll get hired more often. Businesses with the KNOWN badge win 30% more work each month. This is simply because customers feel more confident in hiring someone who’s completed a police or licence check. Want to know more about our background checks? Have a chat with one of our Business Support Team today.